Taking a dip on a hot summer’s day in Iceland’s Blue Lagoon. Photo by Queen Joy, used with her permission. Here we are in the northern Appalachian province of Iceland, in Reykjavik, in a cozy apartment for a three-week home exchange. To keep it straight in your head, remember that Iceland is green and Greenland is ice. (Eric the Red, in one of the earliest known real estate marketing scams, called the island Greenland to spur immigration 1000 years ago.) Iceland is an outcropping of Appalachia’s volcanic Mid Atlantic Ridge, and a big eruption occurred just before we arrived. The spewing had stopped and rain tamped down the ash just before we arrived. Whew! These Icelandic Appalachians are totally down home. They’ve built great museums and galleries, and maintain fascinating historic sites. Today we saw the house where Presidents Reagan and Gorbachev signed a treaty to end the Cold War with Russia in 1986. We found a terrific little coffee shop nearby that serves big, dark, hot chocolates with whipped cream that is practically butter. We are heading north for four nights in two different areas to see more of the island. We’ll do a boat ride where we hope to see puffins and whales. This is a land of raw beauty with waterfalls, steam and geysers erupting all over from geothermal fields. Somehow, I can’t help but think these fields are connected to the hot springs of the Allegheny Front. Think White Sulphur Springs, Berkeley Springs, Saratoga Springs…Yes, it was Iceland’s Eyjafjallajökull volcano that erupted twice last April, halting air traffic in northern Europe. Those people needed to take a break anyway. I was so happy to find a photography exhibit of the early work of Cindy Sherman at Iceland’s National Gallery. She is my favorite photographer. She makes all her costumes and sets, and makes self-portraits in settings of old American movies. After the gallery visit, we lounged at the coffee shop Babalu and played a game of Backgammon there, eating quiche and drinking cappuccino. We also enjoyed “The Volcano Show,” in the lifetime work of filmmakers Ósvaldur and Villi Knudson. Villi personally presents the movies. “I’m always just waiting for the next one to go off. This current one stopped long enough for us to elect the world’s first openly gay prime minister. The volcano will probably will start blowing again on Friday.” Everywhere we went, folks were cool with Jóhanna Sigurðardóttir. It appears they take a live-and-let-live attitude here in northern Appalachia. What’s more, Jon Gnarr, the new mayor of Reykjavik as of June 15, is a writer, actor, and satiric comedian—no joke. We drove the “Golden Circle,” an all-day trip to a national park with the largest lake in Iceland and nearby huge canyons created by the Eurasian and North American tectonic plates that are separating a little each year. 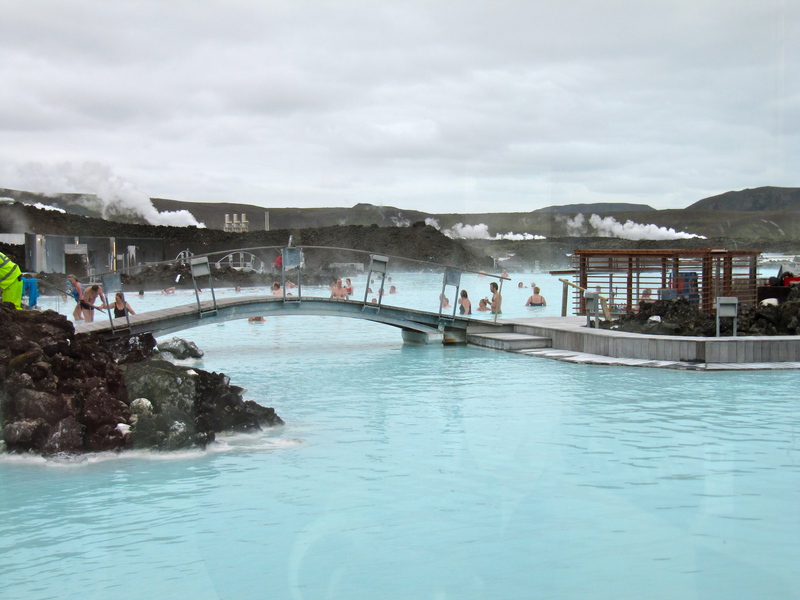 You may have heard of the Blue Lagoon, an enormous geothermal pool that gets its color from silica and natural chemicals in the hot water. We had a beer while we soaked, and met fellow soakers from Germany, France, Quebec and DC. Some tourists go there directly from the airport if their planes get in early and they can’t immediately check into hotels. Then we drove the back roads through lava fields to the Viking Museum, containing a replica of a Viking ship Gunnar Marel Eggertsson built to remind the world that Leif Ericson and his exploring pals were actually from Iceland, although other nations often claim them. (Imagine that.) Eggertsson sailed his ship, the Islendingur, to New York City in 2000 to celebrate the 1000-year anniversary of Erickson’s discovery of North America. We are getting used to trying to sleep while it is still light out. We have taped the drapes closed to keep out light leaks, as the sun is still bright at midnight.